The present paper deals with the identification of 23 fresh water cyanobacterial species belonging to 14 genera from Sai river, Lucknow, Uttar Pradesh (India). A total of 15 algal samples were collected from 5 different sites of Sai River in March 2013. In the present study Anabaena (5), Scytonema (2), Oscillatoria (3), Chroococcus (2), Gloeothece (1) and Lyngbya (2) were found to be the dominant forms, whereas Gloeotrichia (1), Microcystis (1), Aphanothece (1), Phormidium (1) were shown common occurrence and Spirulina (1), Gloecapsa (1), Cylindrospermum (1), Nostoc (1) were found rare. All these forms were reported for the first time from the study site. Fig. : A, Anabaena circinalis Rabenhorst ex Bornet et Flash; B, Lyngbya allorgei Fremy; C-D, Scytonema mirabile (Dillw) Born. ; E, Chroococcus minor (Kuitz.) Nag. ; F, Gloeocapsa gelatinosa Kuitz. ; G, Oscillatoria prolifica (Grev.) 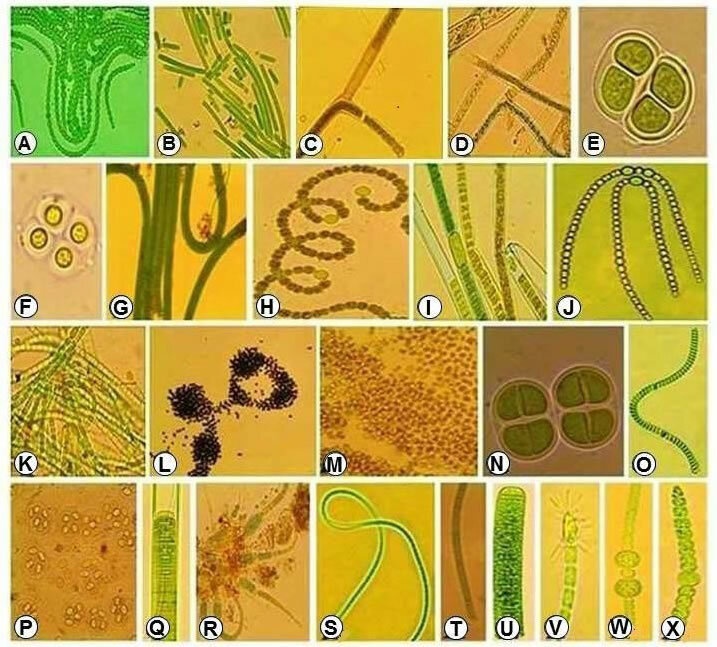 Gomont; H, Anabaena flos-aquae Ralfs ex Bornet; I, Scytonema simplex Bhardwaja; J, Anabaena doliolum Bharadwaja; K, Nostoc punctiforme (Kuitz) Hariot; L, Microcystis aeruginosa Kuitz; M, Aphanothece saxicola Nag. ; N, Chroococcus turgidus (Kuitz.) Nag. ; O, Spirulina major Kuitz. ex Gomont; P, Gloeothece rupestris (Lyngb.). Bornet; Q, Lyngbya confervoides C. Ag. ex Gomont; R, Gloeotrichia longicauda Schmidle; S, Phormidium mucicola Hub. Pestalozzi et Naumann; T, Oscillatoria tenuis Ag. ex Gomont; U, Oscillatoria limosa Ag. ex Gomont; V, Cylindrospermum stagnale (Kuitz.) Born. et Flah. ; W, Anabaena iyengarii Bharadwaja; X, Anabaena torulosa Lagerheim ex Bornet & Flahault.